The Worcester Factory was founded on June 4, 1751 by a group of 15 merchants and craftsmen included Dr. Wall and William Davis, formerly a Bristol technician. In 1783 the business was bought by Thomas Flight, jeweler to the Royal family and the firm's London agent. After his death in 1791 his son John took Martin Barr into partnership and traded as Flight & Barr. The latter's son Martin Barr II joined the firm in 1807, which was then re-titled Barr, Flight & Barr. In 1813 George Barr joined the business, which then operated as Flight, Barr & Barr until 1840 when the factory was acquired by the firm of Chamberlain. A Large Worcester Porcelain Dessert basket c.1770, of oval shape with two ropework handles, the interior decorated with finely painted bouquet of flowers, the exterior with applied florettes at the intersections of the basketwork sides, painted in puce, the rim outlined in brown. Dimensions: 33.5 cm x 27 cm x 12.5 cm. (This example is the largest of the four sizes, produced by the factory). Condition: Minor restoration on the handles. Unmarked. A Worcester Porcelain Teapot c.1770, globular shape, the cover with hand-modelled floral knob, painted in underglaze blue with the popular "Mansfield" pattern and over-painted "Clobbered" decoration in blue, iron red, brown and gilt. Dimensions: 18 cm. high (incl the lid). Painted crescent mark on the base. Condition: Some restoration on the floral knob. 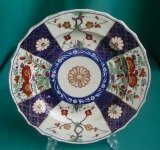 A Worcester Porcelain Plate, decorated in Queen's' Pattern, copying the popular Japanese imari porcelain, of fluted form, painted with dark blue bands in underglaze with reserved chrysanthemums and four panels enamelled in Kakiemon style plants. c.1770. Dimensions: 19.8 cm. Fine condition. Unmarked. A Worcester Cylindrical Mug (tankard) "King of Prussia"* c.1757-78, transfer printed in black by Robert Hancock, commemorating Frederick the Great, dated 1757. Dimensions: 12cm high. Marks: "RH" monogram for Hancock and anchor for Richard Holdship. Condition: a hairline crack. * The subject was taken from Richard Houston's engraving after a painting by Antoine Pesne. Two Worcester Tea bowls,(Possibly painted in the London atelier of James Giles) fluted with scalloped rim, decorated in gilt with a Neo-classical husk chain and medallions about a vitruvian scroll roundel and flower spray. c.1775-80. Dimensions: D.8.5cm, 4.8cm high. Unmarked. Fine condition. A very decorative Kerr & Binns dessert plate with a pierced border, painted with floral motives, the centre with a family crest. Dimensions: 9.75" (25cm) diam. Condition : Fine,slight ware on the gilding. Marks: Impressed circular(uncrowned) Worcester mark, numbers "26"and painter's initials in gilt. A Pair of Royal Worcester Figures of putti and dolphins c.1876, in Raphaelesque style, modelled in abandoned poses riding on the backs of dolphins*, trailing scarves around them, coloured in lustrous glazes. 19.5cm long. Excellent condition. Unmarked. 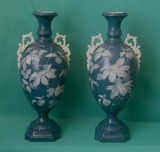 A Pair of late 19th Century Grainger Worcester Porcelain "Pate-sur-Pate" Vases, finely decorated with white slip and hand-tooled with brunches of flowers on teal blue ground, the neck molded with leaves in relief, on octagonal bases. Dimensions: 34 cm high. Fine condition. Unmarked. Worcester (Flight Period) coffee cup and saucer c.1790, with twenty flutes, shanked from left to right, disproportionately large loop handle with inner spur, decorated with hand painted border of berries on a gilt band with puce leaves. Condition: a tiny nibble on the rim of both cup and saucer, slight ware on the gilding. Unmarked. 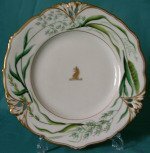 Robert Chamberlain, formerly a porcelain decorator under Dr. Wall, had founded a decorating and enamelling workshop at Worcester in 1783, buying porcelain and earhtenware in the white from Caughley and Staffordshire. 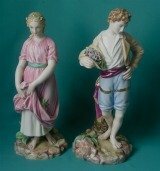 Following his death in 1798 his sons Humphrey and Robert launched into the manufacture of bone china, and were responsible for some finely decorated ware. In 1822 the factory came into the possession of Walter Chamberlain and John Lilley. They acquired the factory of Flight, Barr & Barr in 1840, abandoning Wall's old premises and transfering plant and moulds to their works at Diglis. The united firms traded as Chamberlain & Company until 1852. W. H. Kerr and R. W. Binss took over firm, which 10 years later was converted into a limited company known as the Worcester Royal Porcelain Company Ltd.
An Early Chamberlain Worcester Porcelain Slop Bowl c.1797, fluted shape, painted in pattern 2 with "Plain, enamel'd Foreign spring & crowfoot border". Dimensions: 8 cm high x 16.5 cm diam. Condition: tiny hairline near the rim. Unmarked. Chamberlain-Worcester Porcelain part Teaset c.1815, finely painted with rural landscapes in sepia monochrome and gilt, comprising: teapot and cover, milk jug, slop bowl, plate, two cups and two saucers. Condition: the plate and one cup/saucer excellent, a chip on the spout of teapot and slop bowl/ hairlines. One cup with slightly different gilding. Written marks in red. An Early 19th century Chamberlain-Worcester plate c.1810, painted with a flower study in the centre, the border with moulded flowers on a grey ground, picked out in gilt. 8.5"(21.5cm) diam. Painted marks in red. Fine condition. A pair of Chamberlain-Worcester dinner plates, painted with sprays of flowers, gilded rim. Dimensions: 9.5"(24cm) diam. Excellent condition. Printed marks on "Regent" body c.1811-20. A Set of Four Chamberlain-Worcester Soup Plates c.1846, painted with apple blossom, leaves and butterflies, the moulded border outlined in blue. Dimensions: 26.5cm diam. Marks: Diamond registration mark and "Chamberlain Worcester" impressed. Fine condition.